I love pasta salads…because pretty much, “anything goes!” I used a package of marked down chicken tenderloins ($2.52 for the package), balsamic vinaigrette dressing that I got on sale matched with a $1 coupons (total of $.50 for the bottle), carrots that were $.08 for the bag (sign up for Earthbound coupons here), and veggies that were on sale last week! I also like to buy pasta salad noodles (rotini and shells) “in bulk” to bring down the cost of the pasta! In medium saucepan, cook pasta noodles according to package instructions. Drain and rinse with cold water. Add to serving bowl with 1/2 cup of balsamic vinaigrette dressing. Place chicken tenderloins (dice them first if you like…I didn’t, because I find it easier to cut cooked chicken than raw chicken) into medium skillet with other 1/2 cup of balsamic vinaigrette dressing. Saute for 4-5 minutes each side, or until tenderloins are no longer pink in the middle. Meanwhile, peel and chop carrot. Core, seed and dice green pepper. Dice 1/2 of a large zucchini. (I will eat the other half with some hummus for lunch tomorrow!) Chop fresh basil and parsley. 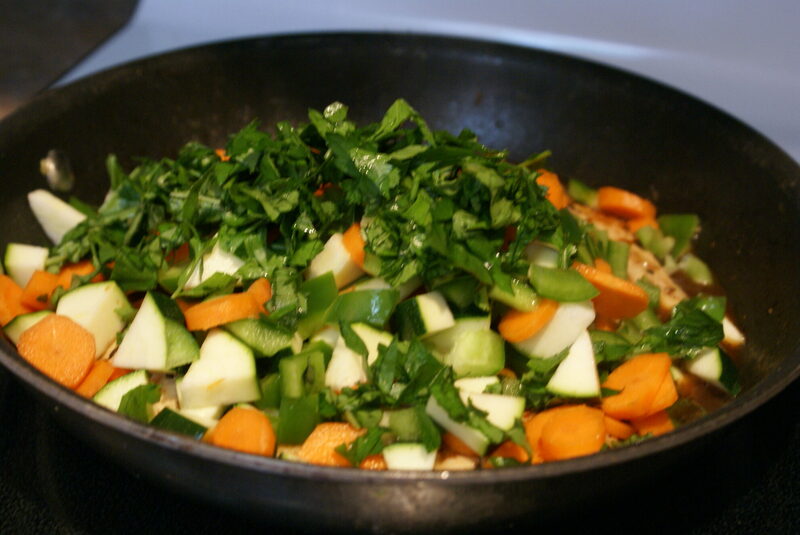 Once chicken has cooked through, toss veggies with chopped fresh basil and parsley into the skillet with the chicken. Add 1/2 – 3/4 cups of water. Cover and let steam for 4-5 minutes, or until zucchinis become translucent. Once steamed, take “sharp” metal spatula or knife and cut the chicken tenderloins into bite size pieces. 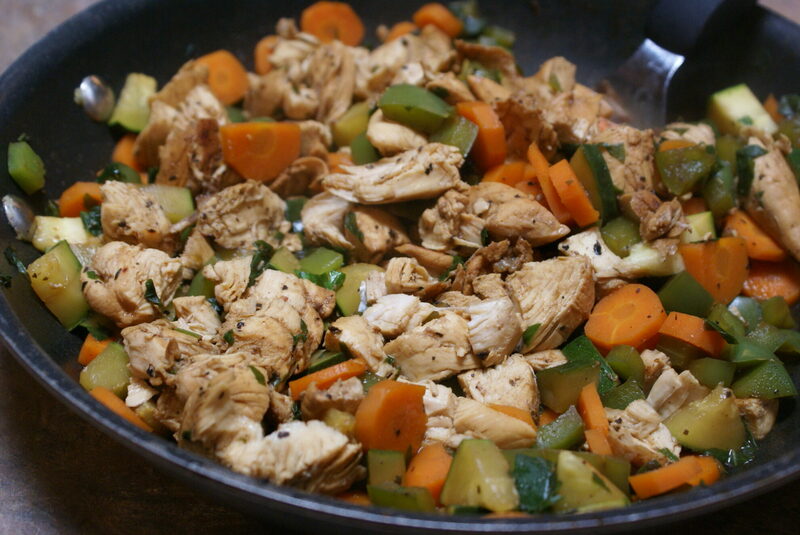 Once cooked, toss chicken and veggies with pasta and dressing. Season with salt and pepper to taste. Optional: Add a few shakes of parmesan cheese to each serving. Serve warm or refrigerate at least 2 hours and serve chilled. 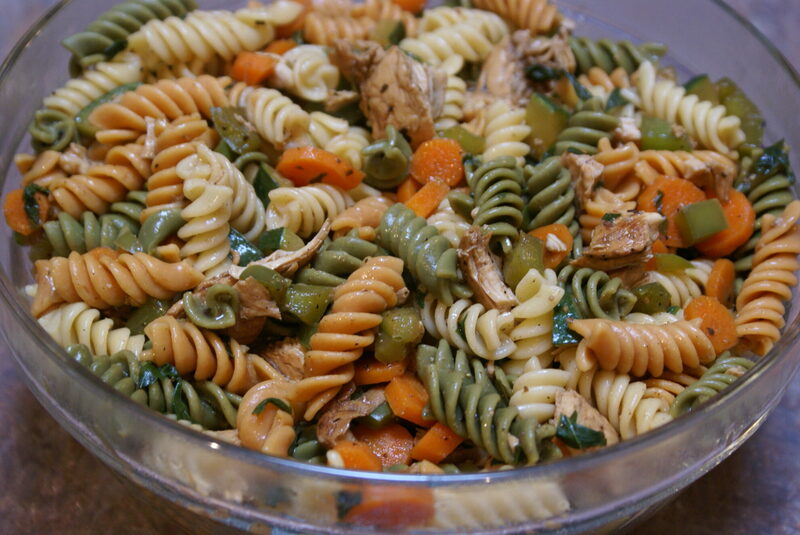 Serve Balsamic Chicken Pasta Salad. What are your MUSTS when it comes to pasta salads? Favorite dressings? Favorite veggies or cheeses to toss in??? Give me antipasta salad with good Italian vinaigrette and salami, mozzarella, etc. OR give me Greek with black olives and feta. Except when I’m pregnant. Then give me Tuna Skroodle salad. I don’t know why. But YUM for 2 pregnancies!!! That looks really good. I make a pasta salad with bowties, broccoli and cherry tomatoes or red peppers. Add some grilled chicken and it’s a great meal to pack on a busy day. Yum this looks deeeelish! I do a variation of this with Greek salad and feta, lots of tomatoes & fresh seedless cucumbers. Mmm I’m hungry now! 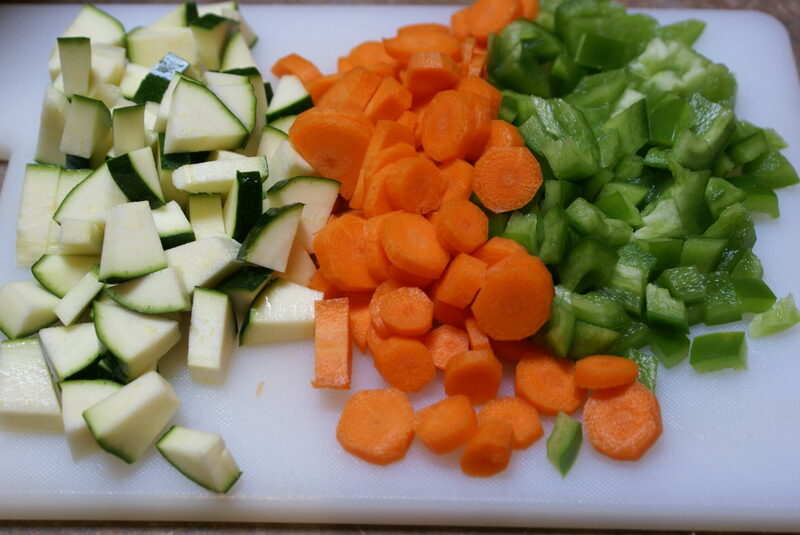 Looks great and I when I need smaller pieces of chicken I just use my kitchen shears and cut the raw chicken. I was amazed the first time I tried this at how well it works plus the smaller pieces will cook more quickly. I do this to make chicken nuggets out of chicken tenderloins a lot but it works for boneless skinless chicken breasts also. Oh this looks yummy. I can’t wait to try it.